Ukrainian earth ionosphere satellite. Cosmos 893. Designation indicates a mass model of the DS-U2-IK (which studied charged particle flows and the ionosphere). However flown after the functional spacecraft's flights were completed. Status: Operational 1977. First Launch: 1977-02-15. Last Launch: 1977-02-15. Number: 1 . Gross mass: 550 kg (1,210 lb). More at: Kosmos 893 (DS-U2-IK GVM ?). Family: Earth, Ionosphere sat. Country: Ukraine. Launch Vehicles: R-14, Kosmos 3, Kosmos 11K65M. Launch Sites: Plesetsk, Plesetsk LC132/2. Agency: MO, Yuzhnoye. Bibliography: 2, 6, 99, 12524. 1977 February 15 - . 11:00 GMT - . Launch Site: Plesetsk. Launch Complex: Plesetsk LC132/2. LV Family: R-14. Launch Vehicle: Kosmos 11K65M. Cosmos 893 - . Payload: GVM DS-U2-IK s/n 1. Mass: 550 kg (1,210 lb). Nation: Russia. Agency: MO. Class: Earth. Type: Ionosphere satellite. Spacecraft Bus: DS. Spacecraft: GVM DS-U2-IK. Completed Operations Date: 1977-02-15 . Decay Date: 1984-10-06 . USAF Sat Cat: 9833 . 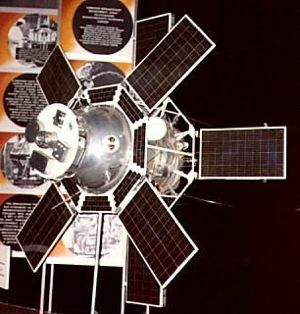 COSPAR: 1977-011A. Apogee: 1,656 km (1,028 mi). Perigee: 354 km (219 mi). Inclination: 74.00 deg. Period: 105.20 min. Investigation of the upper atmosphere and outer space. .